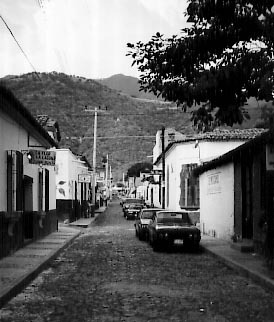 Ajijic (ah-hee-heek) is a colonial village set on the northern shore of Lake Chapala in western Mexico's Sierra Madre Mountains. Founded by the Natuatl Indians in the early 1400's, Ajijic (originally Axixic) was colonized in 1652 by Fray Martin de la Coruna of Spain. Only forty-five minutes from Guadalajara and a half-hour drive from the International Airport. The quaintness of Ajijic has remained unchanged. The village, with its quaint cobblestone streets, Spanish ironwork displayed in the casas and 'villas' and its donkeys that walk down the streets. Ajijic also offers for your enjoyment art galleries, boutiques, weaving stores and a wide selection of cozy restaurants. All of this is what makes Ajijic unique.